I’m cross posting this here and on Science@home because I feel it is so important I want it to get out to the widest possible audience. If you find it useful, please spread the link around or distribute it as widely as you like. First off, I have no medical qualifications. My background is in human biology and general science, so I do understand the hows and whys of vaccines in a general sense. I’m also a parent so I’ve looked into them but not at Google University – I listen to experts, because they have spent years learning the things I don’t know. I’m actually very uncomfortable about writing this with no references, unfortunately I’ve been reading things over the last several months and haven’t taken copies of all of them. I can search them out if anyone wants to challenge anything, but I thought it was more important to get this out there rather than wait until I found all of them again. Hopefully I’ll be able to track them down and add them. The flu is not a bad cold. It is a viral infection that causes symptoms which include a runny nose and sneezing, but also headaches, fevers and general body aches. While most people are fine, they can become extremely ill directly from the flu, or they can catch secondary bacterial infections like pneumonia. Every year around 36,000 deaths are caused by seasonal flu in the US. There are a lot of flu viruses and they recombine and mutate very easily. In fact, 1 in every 1,000-10,000 divisions is an error – one of the highest mutation rates known. If you want the gory details, flu has it’s genes on RNA instead of DNA. DNA is a double helix and both sides have to match up, so there is a check that they are all right. RNA is only a single helix so there is no check, so there are a lot more mistakes when RNA is replicated. The ‘H’ and ‘N’ are names of the proteins that allow it to bind to our cells and are the bits that our antibodies recognise. They come in lots of different forms that work more or less well with different animal cells, so H1N1 just means a flu virus with the ‘1’ variant of these two proteins. There is actually a seasonal flu virus that is H1N1, but the current swine flu has other differences. The current pandemic swine flu is like the little girl with the curl. For most people, it is mild and you are miserable but fine. But for the unfortunate few, when you are sick, you are very, very sick. For these people it is acting as a severe respiratory infection, and if we didn’t have such good intensive care units our death rates would be a lot higher. The very scary thing is who it is affecting – not the old, not those who are already sick, but the young, the healthy, and pregnant women. Many people are not dying of underlying conditions – they were healthy before they had swine flu. This is one reason there is a push to vaccinate everyone – you can’t say just vaccinate those at risk, like we do with seasonal flu, because we are all at risk. Pandemic swine flu appears to be more infectious than seasonal flu. Your chances of getting seasonal flu are usually around 10%, up to 40% if you have kids. But so far infections for swine flu seem to be running at 20-25%, more if you have children. It’s hard to tell because many places are not swabbing for swine flu anymore. The reason there has been so much concern about swine flu has nothing to do with what it is as a disease now. The worry is that the 1918 Spanish flu was also H1N1. It killed 50 million people. Now obviously 1918 was at the end of WWI and pre-antibiotics, so that had something to do with the number of deaths. But like the current swine flu, many of the deaths were directly from Spanish flu. Plus that is only the number of deaths, the number of infections was far, far higher. And while we have antibiotics today, we also have aeroplanes and mass transportation. Just think about those numbers for a minute – can our hospitals cope with that number of seriously ill people? Does the world have 50 million ventilators? Do we even have 50 million courses of antibiotics? In a word, No. If a pandemic such as the 1918 Spanish flu ever hit again, even our safe healthy first world would be in a lot of trouble, and there would be a lot of deaths. And developing nations would be even worse off. This is why governments are scared. This is why they are trying to stop it now, before it mutates, because history shows us this is what happens with pandemic flu. This is why they are trying to get everyone vaccinated, not just to protect the young healthy people with no risk factors who are dying now, but the less infections there are, the less chances there are for it to mutate. There are a few different vaccines currently being used. The main difference is that the one in the US has no adjuvants and requires two doses, the ones in Canada, Europe and Australia contain adjuvants. These are chemicals added to a vaccine to induce a stronger immune response, which is why only one dose is needed. There is also a vaccine that has not been grown in eggs so it is safe for people with egg allergies. There seems to be worry over how quickly this vaccine has been produced, but in reality it is backed up by years of experience. Every year the most common strain of seasonal flu is chosen and turned into a vaccine, this has been happening for decades. The process is well known and has been approved in all countries that use those vaccines. So all that has happened is that samples of H1N1 have been used to produce a vaccine in exactly the same way as the already approved ones. In addition, the H1N1 vaccines have been tested for safety. This is not a rushed or untried new vaccine, the exact virus involved is new, but so is the flu vaccine produced every year. Flu vaccines do contain thimerosal/thiomersal as a preservative, which contains mercury. However there are several points to keep in mind here. Firstly, the amount of mercury is less than you receive from a tuna sandwich. Secondly, thanks to scaremongering thiomersal in vaccines has been intensively studied. There are literally dozens of high quality studies from around the world which have shown it is safe. There is no credible evidence at all that it is dangerous. Finally, it shows a misunderstanding of chemistry. There is no mercury floating around in vaccines, it is all in the form of a compound. Common table salt is a compound of sodium and chlorine. On their own, sodium is explosively reactive and chlorine is highly poisonous. But when they are chemically bonded in a compound they are safe. Thiomersal contains mercury in the same way salt contains sodium and chlorine. There is also worry over side effects of the vaccine. The main one that is due to the vaccine only is a sore arm, or possible allergic reactions that can cause anaphylactic shock. This is an extremely rare side effect – for example there has been one death in Canada out of millions of immunisations given. This is an acute reaction, which means it comes up within a few minutes of the vaccine, and is the reason you are asked to wait at the clinic when you have your needles. If you have waited and have not reacted, you aren’t going to. The other side effects are not really effects of the vaccine, they are effects of the virus. An example of this is febrile convulsions caused by a fever spiking. But the fever isn’t caused by the needle, it is caused by the small dose of swine flu. This is a dangerous effect, definitely, but the question then becomes – if a child reacted to a small, mild dose of swine flu by spiking a fever, how would they have reacted to a full infection? No-one can know, but chances are exactly the same thing would have happened. If you are prone to fevers or convulsions then it is still safer to get the vaccine, because it is a milder form and a smaller dose so you are much less likely to have problems. Guillane Barre syndrome (GBS) is another dangerous side effect caused by the virus. This is a form of paralysis that resolves in 95% of cases, though it takes weeks or months of therapy and is dangerous. It is possible that there is a 1 in a million chance of developing GBS syndrome after a flu vaccine, although I’ve recently seen a researcher say there is no link. That sounds dangerous, but there is a 40-70 in a million chance of developing GBS because of flu. Once again, it is safer to have the vaccine. Currently H1N1 is mild for most people, but it is more dangerous than seasonal flu and is seriously affecting people who are not considered at risk for seasonal flu – people who are young and otherwise healthy. It is more infectious that seasonal flu. A major worry is that it will mutate and become more deadly, like the 1918 Spanish flu. Our health system could not cope with a pandemic on that scale. The vaccines are based on very well known and studied technology and have been tested. Most of the dangerous side effects are caused by the virus itself. You are less likely to react to the vaccine virus than you are if you actually catch the flu. Thanks to Hoyden About Town for the heads up on this story. To start, I thought I’d dig out this photo for the Sydney Morning Herald, they don’t seem to have been able to find it. I’m hoping I’ve interpreted it correctly that I can use it. On to the rest of the article. Well there’s a nice characterisation to begin with – we’re babies who throw tantrums and over-react (that’s general, I don’t like the Mummy blogger tag and many of the people involved aren’t). And all in the first two lines. So do we deserve it? There was some pretty nasty stuff going around on Twitter from both sides. But have a look at the actual blogs and listen to the non-bloggers involved in the boycott. Does this sound like a tantrum? Or this? Or even this? And the fury was there well before Nestle refused to answer questions. Not doing well so far, Sydney Morning Herald. Let’s have a look at the rest. They got something right, Nestle is one of the world’s most boycotted companies, but it’s not just a dirty water issue. Please don’t get hung up on formula and forget the child slaves or water rights. And their timeline is basically backwards, implying that there were already large social media protests and Nestle needed a chance to ‘give their side.’ Sorry guys, not quite how it happened. Nestle set the event up, probably to test the waters using social media for marketing. Incredibly cheap marketing don’t forget – what is the cost of giving 20 people a weekend away and giving their family some steak compared with a television campaign? According to at least one of the attendees, they’d never heard of any questions about Nestle’s ethics and it wasn’t what the conference was about. But the skewed timeline in this report makes it look as if poor little Nestle was just defending themselves against those nasty activists. No bloggers were interviewed (or at least there are no responses in the article) but Nestle Australia was. “This just goes to show that the blogosphere is a tough place to try to have a rational argument!,” she wrote in an emailed statement. Well as a blogger and a Mummy*, whom the Sydney Morning Herald didn’t consult in this story, I have a few comments on that statement. Nestle hasn’t engaged anyone in the blogosphere on the boycott and their marketing practices, but this list of questions would be an excellent place to start. It looks pretty rational to me. The large, informed, vocal group was telling you they were infuriated way before the event happened. It’s because of those dying babies and child slaves. One of the reasons we’re infuriated is you don’t do anything. You talk, you make statements, you spin. But you don’t debate. You don’t answer questions. You don’t change your unethical marketing practices. You don’t buy fair trade cocoa. Answer those questions from PhD in Parenting. As soon as you do, I’ll help get your answers out there. Answer some of the other questions you avoided on Twitter. Agree to the 4-point plan for ending the boycott – it’s only four points! You can do it! Decide that maybe lives are more important than profits. You’re one of the world’s largest food producers, so you do have the economic muscle to effect change. And SMH? I came away from the original Twitter storm thinking the bloggers invited were a bit naive. But after all, they’re amateurs who just didn’t think that things like child slavery still exist and didn’t think to check out the company talking to them. And who wouldn’t be flattered – a multinational company thinks I’m important enough to invite? I’m not a journalist, I’m a mother and a blogger, with absolutely no training in writing or journalism. But I can manage to do at least a little bit of reading on this issue and discuss it without meaningless, insulting cliches. I think there is a lesson for both types of media here – bloggers need to realise that with readers comes responsibility. And journalists need to remember that they are under scrutiny. *Actually, there are only two people on this earth who get to call me Mummy. Neither of them has anything to do with Nestle or the Sydney Morning Herald. Those of you on Twitter have probably heard about the #Nestlefamily debacle. It’s made it’s way onto Facebook as well, and of course the blogosphere. If you’re wondering, very briefly, Nestle offered several Mommy Bloggers a junket, in return they would write and Tweet about Nestle and their products. Many activists found out about this. It started polite but degenerated into name calling, racism and extreme nastiness. There’s a good round-up of it here with some eye-opening comments. Extremely briefly, for those who don’t know, Nestle has been the subject of a boycott for about 30 years. They aggressively market infant formula to mothers in third world countries and marginalised groups (read race) in developed nations, telling outright lies and giving free samples. Then when mothers have lost their own milk they stop giving it out. That’s how I kill babies. But wait, there’s more. You see Nestle is a huge corporation that does more than baby formula. They also sell things like bottled water, which has to come from somewhere. In the US, rural communities have been pressured and manipulated and their water rights have been stolen. That’s why I am a thief. And chocolate? Most of the world’s cacao comes from Ivory Coast where many of the farms use child slave labour, children who have been kidnapped or sold by their families. That’s where I keep my child slaves. The blogs I have linked to and Baby Milk Action have covered it in detail from a number of perspectives, and I didn’t want to write about it unless I had something different to offer. But a comment on one of the blogs started me thinking about evil. My own personal definition of evil goes something like “knowingly hurting other people unnecessarily.” I think we can all agree that Nestle qualifies. And unfortunately, so do I.
I know what Nestle does and I help them do it, either by buying their products or saying nothing. And there’s no way I can argue that chocolate is necessary. How can I do this? I think it comes down to the personal. When I read a comment that “the only child slave labour in this house is my kid opening a Crunch bar,” I feel revulsion, and I’m sure many of you do too. When I see a picture of a Pakistani mother with twins, one healthy, one half the size and dying, I am horrified, and I’m sure you are too. When I read about these things I resolve to boycott Nestle and all the other products it profits from. But when someone gives me a lipgloss from The Body Shop (not tested on animals! shame about the babies) am I rude to them? When my cat only eats Friskies biscuits, I still like having dry food available rather than only meats. When I get my little girl a treat it’s convenient to have the Peters tub of vanilla icecream rather than the stick she can wave everywhere while it melts. And so in the everyday details my horror and revulsion and resolve are lost. Children in Africa, Hispanic mothers in the US, I feel for them in the moment but they are too far away from me personally to permanently impact on my heart. So I need to make this personal. I need to internalise it and make it about me, my children, my community. Maybe then I will be stricter about finding out all the brands to avoid. Maybe then I will be polite but firm with people who give me gifts. Maybe then I will start to tell others about this (that’s one of the things I found most shocking – that so many people don’t seem to know) rather than keeping the peace at playgroup. Being a good person is important to me, maybe the brutal realisation that I am evil is a way I can personalise it and force myself to do something about it. How is it personal for you? Because I don’t want to remain evil. Do you? Recently I saw an interview with an author in the US. She was discussing the aftermath of an article she had written after letting her 9 year old son take the subway by himself. Parents across America were divided- was she putting her kids in danger or promoting independence? And so the term ‘Free Range Kids’ was coined. The philosophy behind free range kids is simple. The world is not the scary, dangerous place that the media would have us believe. Crime rates are somewhat unchanged since the childhoods of the 70’s and 80’s. Children should be able to ride their bikes to school, to play in the street outside their home and to get their mail out of the letterbox- without their parents by their side. I myself am in two minds. I have fond memories of cricket games in the street, of playing spotlight with all the kids in the neighbourhood, of the park at the end of our street being ‘the place to meet’ after school to decide what kind of great adventures we would have that afternoon and of course, the great philosophical discussions that my brothers and I had on the walk home from school. Of course, there were rules. Mum had to know who we were playing with, and she always knew their parents. We had to be home by the time the street lights came on and we couldn’t just wander the streets. Generally we were always playing outside, so if Mum needed to find us she could have just followed our voices. When my brother was around 10, he and our cousin decided to go for a bike ride around the streets near our home. Somehow they were split up and my cousin couldn’t remember how to get home, so he went into a safety house who let him come in and ring our Mum. The lessons our parents had taught us about what to do if we were lost were put into practise and thanks to the kind neighbours, our cousin was home safely. And the next time the two went out riding, they stuck together. But on my recent wanderings around the streets near my home, I couldn’t spot a single safety house. Where have they all gone? Has society changed too much that no one wants the responsibility? Is anyone even home? So now, as a Mum, I have started to contemplate the concept of my child being a free range kid. We live in a quite street and know our neighbours well enough to have a chat in the front yard and to take their bins out when they are on holidays, and I hope by the time he is old enough to be outside by himself that they would know him well enough to keep and eye and an ear out for him- just like I would do for any other children. Theoretically I would love for him to have the kind of childhood that I did- lazy summer holidays where swimming, water bomb fights and sleepovers were the features of our days. Where Mum and Dad didn’t have to drive us all over town to socialise, because our friends lived next door, or across the road. But I don’t even know if this is realistic anymore. Are kids home in their school holidays? Do they go outside to play? Thankfully, I’ve still got some time to think about this…my son is just 11 months old. What about you? Would your decision depend on your child’s age? Or the suburb you live in? Are you raising free range kids? As part of a new job I have to do 4X4 training (even though I have been working out bush for the past year and practically grew up in the back of a car… damned gypsy parents). Usually I take my daughter with me to work but this week she has been in the care of a fantastic stay at home mum who has child care certificates, family day care experience, foster caring experience and two children of her own. Obviously this woman is worth her weight in gold to the average working mum. My job requires me to travel out to remote locations and getting to this point (a few weeks into the job) has been a roller coaster of will I/won’t I feelings. Firstly there was the old feelings of neglect. Am I doing what is best for my girl? Then the feelings of self doubt. You know, the ones that seem to be ingrained into us against our will by some chromosome more often linked with X’s rather than Y’s. Then the feelings of personal gain – money, experience, doing what I love, open roads, sing along opportunities in the car – all the really important things (obviously this feeling was the winner … I can’t resist an option that has a sing along). But now I have landed and am trying to make it work. I have days where I appear at the office with a screaming child and interestingly I get more done in two hours than I usually would in a day without the beautiful little smudgekin who has the voice of a feral cat fighting a broken violin. I worry about where I might be next week. I worry about the conditions that I might be facing. I worry about whether or not there will be a suitable spot to park a developmentally delayed child with special needs. Will I be adding to the chaos or creating a positive learning experience based on catering to young learners with varied needs? And then I remember … History repeats itself doesn’t it? Isn’t this the story of my life so far? Wasn’t that me in the back of the car all of those years ago? Isn’t that where the sing along was invented? So all I have to do now is ponder one thing – Was my upbringing good enough for my daughter? I think the answer is inevitably yes. Yes to covering the land. Yes to meeting new people. Yes to taking in different cultures and ideas. Yes to bringing about positive change and learning. Yes to sharing life on the edge, in the middle, and everywhere in between with your children! It’s not as if you are letting the tiger in your car or rollerskating in a buffalo herd. So as Roger reckons ; ‘Knuckle down buckle down do it do it do it’ because ‘you can be happy if you’ve a mind to‘ … and who said you can’t just change the film when the kid is sleeping? Or get a digital camera? I haven’t blogged in a few weeks because I’ve recently returned to work, and it turns out that being at work takes up a lot more of my time than I remember. Some mornings, it really does take ages to get a toddler out of bed and dressed. Anyway, being that I’m back at work, I’m back in the swing of packing lunches. I have a bit of a thing about lunches – I love packing tasty, healthy foods. Even more than that, though, I like packing pretty lunches. The Japanese have a tradition of packing nifty lunchboxes, called bento. The word ‘bento’ simply means ‘boxed lunch’ or something like that, but that’s a deceptively simple explanation. The most simple bento is a box of rice with an umeboshi, but bento may also be incredibly elaborate. 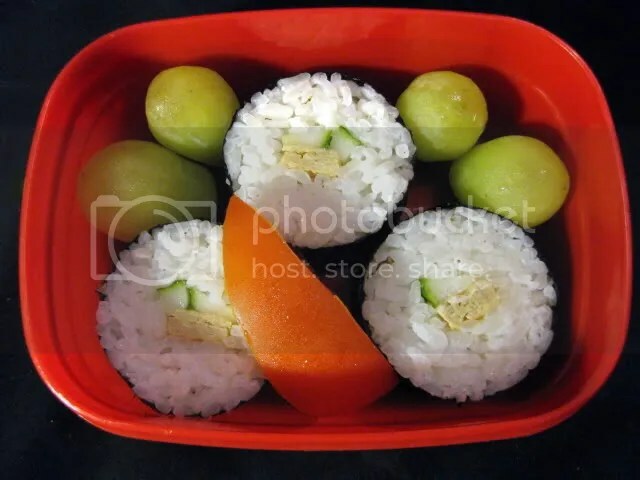 Apparently some mothers at certain kindergartens in Japan compete with each other to make the most intricate bento for their children, with the result that they spend hours fiddling about with food. I don’t do that. I like speed bento. Although I like spending a few minutes on pretty flourishes sometimes, I really don’t want to spend more time preparing a lunch than I do eating it. There are plenty of resources around on how to pack a bento for adults. Where I find bento techniques incredibly useful though is in packing toddler lunches. Bento has taught me three things. The first is how to choose and pack foods so that they’ll be safe to eat. The second is how to make the best use of available space – the more compact a lunch, the better, in my view. The third is how to make lunch look delicious. Everyone eats first with their eyes, and then with their mouth. This is particularly true of toddlers, who are notoriously fussy. Even children like mine, who will eat anything at all, have fussy days – favourite foods suddenly become anathema and are eyed suspiciously. Bento encourages the use of colour, particularly foods which are colourful in their natural state – different coloured vegetables, and the fresher the better. 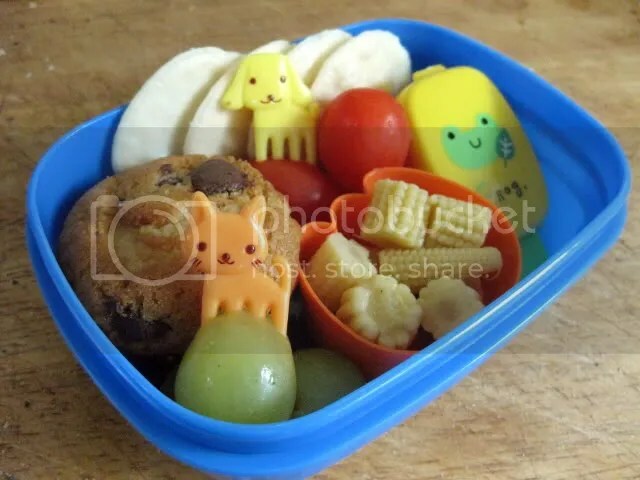 Bento often also incorporates cute touches like miniature food picks or vegetables cut into interesting shapes. Little picks are not just pretty – for a toddler, they can be a way of making some foods easier to eat. Little divider cups don’t just keep food separate – toddlers love investigating containers and sampling the treasures contained therein. You don’t need a lot to get started with bento. You can spend a lot of money on a purpose-designed bento box, or you can simply use any old plastic container. Because I have a bit of a thing about lunches, I do have quite a collection of bento boxes, but I also have quite a collection of other plastics. 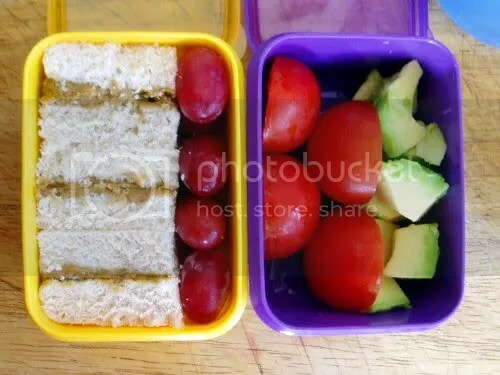 The toddler bento pictured in this entry all use containers bought from a supermarket or department store: the first two are Willow containers, about $8 or $9 for a pack of three; and the third are made by Décor and cost less than that, again for a pack of three. I collect plastic spoons from our local gelateria and icecream parlours. Although you can buy vegetable cutters to make flowers or animals, you can also easily and quickly cut fruit into traditional designs. Reckon you can do it? I reckon you can! Pretty soon you’ll be looking for excuses to pack lunches for your kids – or for yourself. Some of you may realise what triggered this post, but it’s something I’ve been mulling over for a while. So although it was triggered, it’s not pointed at anything in particular but more food for thought. It’s good something gave me the push to put it out there. We are sometimes told we should respect others’ decisions. I don’t think it takes long to realise that this is wrong. Respect is about esteem and admiration and there are some decisions that should not be admired, such as the decision to have that third piece of cake. Then there are some decisions some will admire and others won’t, which is why we have controversial issues. A trickier one is when we are told we should respect other’s rights. And of course we should. So long as they actually have that right in the first place. The appeal to tolerance is almost guaranteed to shut people up, because being intolerant is such a terrible thing in our society, the modern heretic. But before proving our tolerance we need to question why they want to silence us. Sometimes it is just because they’re tired of the argument, and then it’s probably a good idea to let it rest. Sometimes it’s a shorthand way of saying “I don’t care what you say, you’re not going to change my mind so respect my rights.” And in a face to face conversation it’s probably a good idea to shut up, because no-one likes talking to a wall. But the internet is a special case, a conversation in a darkened room. You never know who is listening, and who might still be willing to change their mind. So sometimes it might be worth it to keep going. In that case, it is important to work out if people really do have the right they are asking you to respect. In ”Crimes Against Logic” Jamie Whyte points out that rights are defined by duties. In other words, if you have a right, others have a duty to uphold that right. If you have a right to life, others have a duty not to kill you, and the laws will punish them if they breach that duty. If there are no duties, then there is no right. The right I’m going to talk about here is the right to parent as I see fit. The duty that would seem to go with this is that everyone else has to support your parenting decisions. But hang on a minute, what about those unrespectable decisions? What about the controversial ones? What about the rights of the child? Ah. The right to parent as you see fit runs into the right of the child to the opportunity to reach their full potential. Now it seems to be pretty obvious that a parent should be making decisions that respect their child’s rights. But do they? For the vast majority of us for the vast majority of the time I’m sure they do. But we all know examples of when they don’t. And in those cases, whose right does the law uphold? The child’s. So in reality, in our society, we do NOT have a right to parent as we see fit. We have a duty to uphold our child’s right to the opportunity to reach their full potential. So we come back to those controversial issues. I mean aren’t I just playing with words here? This is Australia, we don’t take kids away unless it’s really bad, so isn’t this just rambling? And don’t parents make those controversial decisions because they know the situation better than you do and believe they are fulfilling their duty? Well, yes. To a certain extent I am. But I think there are two very important consequences of looking at things this way. The first is psychological. Rights are personal. They are about property. They are mine. In fact one of the definitions of rights is “a claim to property.” Is that how you perceive your children? I’m not making a way out of left-field argument here, there are people who treat children as property, and if they have the right to parent as they see fit, then they have that right. Stepping back from the extreme, people become defensive and even combative when they feel their rights have been breached. In a discussion about ‘those issues’ it means they will shut down and stop listening because they are barricaded in, prepared to defend their rights. This is where the appeal to tolerance comes in – I’m feeling threatened and I want to end this. You’d better be careful, because you’re stepping on MY RIGHTS. No-one feels that way about their duties. It’s not as common for people to get possessive about them (leaving aside status issues), because generally we perceive them as work and are happy if someone helps us with them. And they make us careful – we can be cavalier about our own things, but we are much more careful about things we do for others. While rights tend to be static (you always have the same right to life), our responsibilities change over time. So if we truly want to have an open exchange of ideas, it’s much more likely to happen in the realm of duty and responsibility. If we want to improve our own and support others to improve their parenting, that’s where it’s going to happen. Notice that nowhere am I saying that I’m right and people should agree with my solutions to the controversial issues. What I’m talking about is listening to other positions and being prepared to accept the possibility that the others have a point, and that goes for me as much as anyone else. Of course, that assumes people’s minds are open and they want to improve how they fulfil their duties. But that’s ok, because the second consequence of redefining this right is to protect children. Because while rights are personal, we all have the duty. If you have a right to life it is the entire society that has the duty to fulfil that. If children have the right to the opportunity to reach their full potential then it isn’t just the parents who have a duty, it is all of us. We all have the duty to look out for children. To protect children. To support and nurture them. And perhaps if we stop thinking about parents’ rights and start thinking about our collective duties, we might start to take action, even if it’s only speaking up to be counted. so I don’t have to respect it. But I have a duty to look out for your children, and as far as I can, I will.